This week at Two Writing Teachers we will be sharing ideas about teaching writing with mentor texts: from published books, to student work, digital media, to teacher-created texts. This blog series will inspire you to dive in and find the perfect texts to learn from with your students. The first time I had ever heard of a mentor text was in a lecture hall at Teachers College in New York City, about 14 years ago while I was a graduate student. It had been a long night. I had gone from teaching all day, to one evening graduate course with one instructor, straight into a second class with Lucy Calkins. The old wooden seats were hard and uncomfortable. My stomach growled. I could feel a headache coming on. Then she started to read aloud Shortcut by Donald Crews. Good stories have a way of putting you in the moment. Everything else seemed to fade away, and I was completely pulled in. Shortcut remains one of my favorite mentor texts to this day. And time and time again, I’ve returned to the template of how Lucy introduced a mentor text. First, I always read aloud for meaning, just to enjoy and understand the story. A regular read-aloud. Second, I read it like a writer, to pop out the strategies the writer may have used, for craft, or to imagine the process the writer might have gone through to create the text that is in my hands. Last, I connect what we’ve noticed on the page back to the writer: a real live person did this — and so can you! Not try it! The last part, trying it, is crucial. Katie Wood Ray says, in Wonderous Words, “I can see a structure used in several different texts, understand it as separate from any one of the topics in those texts, but until I write a little bit of it myself, I only know it as a reader. I haven’t pushed myself to know it as a writer” (1999, p. 144). When I’m planning to read aloud a book for the first time to students, I plan ahead for the places I might want to model my own thinking. I plan the best spots to think aloud or react to the story. I also plan ahead for the best spots to give the students a chance to stop and think about the text. Often I’ll prompt students to jot something down, or talk with a partner, or dramatize a part of the text. I often open it up to whole class discussion as well. Sometimes I plan to read aloud the entire text first, without stopping much at all, and then reread with more conversation built in. When I’m planning to read aloud a book to students to support their writing, it is almost never the first time they’ve seen the text. They’ve already listened to and discussed the story at least once, if not more than that. Almost always. For example, a few weeks ago I visited a third grade classroom to demonstrate a lesson on informational writing. Thinking that I was using the same mentor text as their teacher, I opened up a page of Deadliest Animals by Melissa Stewart, planning only to study the first page of what I thought was a familiar book to the kids. It would have been much more effective as a writing lesson if the students had already known the book Deadliest Animals. That way, I would have been free to refer to just one page of a familiar, beloved text. Once they knew the book, I could have returned to Deadliest Animals again and again to study different strategies and devices used by the author, Melissa Stewart. Step 1: Pick a book to read aloud to your students. Aim for a book that is both a GREAT book to read aloud, and is somewhat similar to the type of text your students are writing. Step 2: Read the book to yourself as a reader, thinking, “What comprehension work should I demonstrate for students by thinking aloud as I read? Where are good places to stop and have a conversation?” Mark places to stop using post-its. Step 3: Reread the book as a writer, thinking, “What, specifically, is the writer doing that I could teach my students to do?” Mark the particular pages you might use. These are pages you might use in a minilesson, or a conference, or a small group. The best mentor texts can be mined for many teaching points. Step 4: Try creating your own example of writing, modeled after the mentor text you just planned. You might also refer to your favorite professional books on the subject. Speaking of which, our own Stacey Shubitz has a new book coming out titled Craft Moves: Lesson Sets for Teaching Writing with Mentor Texts. See below for details! This giveaway is for five copies of Craft Moves: Lesson Sets for Teaching Writing with Mentor Texts by Stacey Shubitz. Many thanks to Stenhouse Publishers for donating a copy for five different lucky readers. 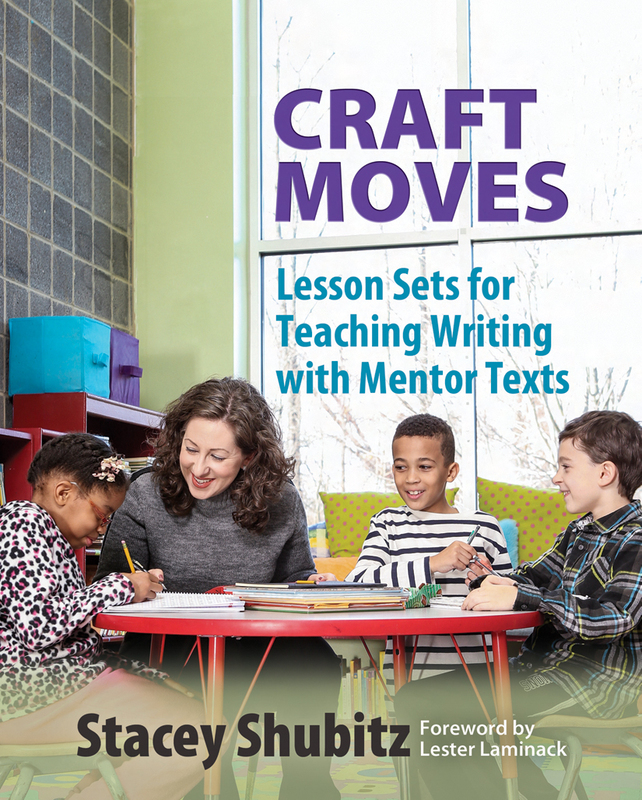 For a chance to win one copy of Craft Moves: Lesson Sets for Teaching Writing with Mentor Texts, please leave a comment about this post on any post in the blog series, including this one, by Sunday, May 8th at 11:59 p.m. EDT. Beth Moore will use a random number generator to pick the winners, whose names she will announce in our blog series’ IN CASE YOU MISSED IT POST on Monday, May 9th. You may leave one comment on every post in our Teaching Writing with Mentor Texts blog series, which runs May 3rd – May 8th. Stenhouse will ship a print or ebook to winners in the United States and Canada. If you live outside of the U.S. or Canada and you win a copy of Craft Moves, then you’ll receive an ebook. If you are the winner of the book, Beth will email you with the subject line of TWO WRITING TEACHERS – CRAFT MOVES. Please respond to her e-mail with your mailing address within five days of receipt. Unfortunately, a new winner will be chosen if a response isn’t received within five days of the giveaway announcement. Writing as a reader/Reading as a writer using mentor texts is exactly our professional development topic in my school. I am enjoying reading all the blog posts on this topic. This post gave me the courage to start mining through the books I love and my students love to look for … why they are so loved. I just starting with writing workshop so this blog has been a wonderful resource for me. Thanks for the suggestions and inspirations. I love using mentor texts with my students! Even my less confident writers feel successful due to the modeling and scaffolding mentor texts provide. Beth, in this blog post you make the work seem so accessible and doable. I think even I could do this- thanks for the inspiration! I’m looking forward to sharing this with my Lit. Coach, and our teachers next year. Your tone is so friendly that I think many teachers would not be scared off and would be willing to TRY IT! Looking forward to reading Stacey’s book! I loved the last section: Now try it. This leaves me with actionable steps to apply this to my teaching right now! I love this! I think we will be doing some of this “practice” in our summer PD. So often teachers feel pressed for time and try to cram in everything, but it falls short. Great post! I appreciated step four of your process. It is so important that we, as teachers, try out the craft moves we want the kids to try out (from published texts)! Great post, and totally agree that students must be able to enjoy the book as readers first! Definitely adding Shortcut to my library and I can’t wait for Stacey’s book! One of my goals this summer is to improve my conferring and mentor text selection and collection is a big part of it! I love how you pulled us in with your micro-story about Lucy and Donald Crews!!! I’m new to using mentor texts in our writing class, and I’m so sad that I have not been using them all along! Thank you for the amazing posts!! Love using Mentor texts in my writing workshop, especially those I have shred in reading and other subjects. The reading and writing connection is a valuable tool! Loved your “Try It” section! I will be sharing them with teachers. I love using mentor text techniques to teach writing crafts to my young students and am always looking for new ideas. I eagerly look forward to, read and reread Stacey’s posts to your blog. I can hardly wait to read her new book! So glad my mentor text posts have been helpful, Libby! Love everything mentor text! Recently pushes my own thinking teaching about the difference between texts as sources and texts as mentors. Love that this post stays true to the purpose of mentors: to inspire us to write like…. instead of to write about…. I am so excited to run across your site and can not wait to read more. I struggle with teaching writing and hear other teachers talk about using mentor text, but I have no idea how to get started. I am hoping to gain some wonderful insight! I love this site and can’t wait to read Stacey’s book. Thanks for a great post, as always. I’m honored you’re planning to read it, Amy. It’ll be out in June. I needed that! What a gem this resource book must be. Thank you! A very inspirational post. Keeps me reading and keeps me writing! I love the idea of using mentor texts for reading and writing. I especially like the idea of bringing it back to the writer. It’s so important for students to realize that writers are real people just like them. Fabulous post, Beth! I find myself suggesting to kids that we “mentor ourselves” to certain authors and their texts often in conferences. Love the simple steps teachers can use to get started!! Thank you so much for your post! I appreciated your point that you made, sharing that the text should be a familiar text for analyzing as writers. Wow, I never quite understood why my colleague always insists upon choosing a mentor text that students know well to support writers. Now I do, so thank you! I’ll never make this mistake again! We were just talking about mentor texts in our ELA committee meeting this morning. Thank you for the great ideas!! Thank you for this post! I feel this is an area I struggle with greatly, so the steps here and your own experiences are extremely helpful! I appreciate you taking the time to share this out with us! This was perfect timing. I’m just starting to read To Kill a Mockingbird to my 8th graders today and this year will be explicit about it being a mentor text for their writing. Reading like a writer, writing like a reader. My favorite quote to share with students. Thanks! This book looks fabulous. I can’t imagine teaching writing without using children’s literature! Thanks, Julie. I, too, believe we need to hold up quality examples of children’s literature in writing workshop. I think it is so important to show our young writers that they ARE writers and can stand on the shoulders of other mentor writers through examining their work and then trying these techniques in their own writing. Thanks for the wonderful post. It is such a powerful teaching technique, to read a book twice, once as a reader, and again as a writer to mine from it the author’s craft. Thank you for the detailed blog post on mentor texts. My life as a teacher changed when I figured out how to have my students “read like writers”. I was sitting in a session with Matt Glover and he changed my thinking and teaching forever. The pressure is really gone to BE the example or the one who knows how to write. I know now to lean on the big dogs, my students, and my own attempts as an author! 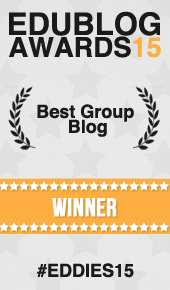 Thanks for your work with this blog series! I’m honored that you’ll be sharing my book with teachers in the PDs you’re leading this summer. Thank you! Mentor texts are essential for growing writers, as are stories about the authors behind students’ favorite books. They need to understand that their favorite published authors are real people. I’m using mentor texts in some of my writers’ workshops. I love showing kids how real authors use mentor texts too. Thanks for this opportunity for the craft books. Mentor texts are a crucial part of Writing Workshop. They unlock the mysteries of writing for many students. What a great post! It is always such a turning point for a young writer when they realize they can try out the techniques that authors they love use. It transforms them in some way! Thank you for the step-by-step process. Also, the book looks like such a great resource for any writing teacher! This is the exact process I use with teachers (and kids)… and it works great! Thanks for affirming my work! I look forward to taking a peek at Stacey’s book. Thanks for sharing! I’d be honored if you did, Morgan. Excellent post! Thanks. I am beginning to gather summer reads, other than Stephen King, to pre-plan for. Next this. This is perfect! Since our district is moving toward more reading and writing focus, I need to brush up on my practice. Again, thanks for the insight. I appreciated reading about your first experience with mentor texts. In my building, we have been blessed to spend the year diving deep into writing workshop, and I have grown so much as a writer and instructional coach. I am excited to share this post with my teachers and would love to check out your book. I appreciate your insight on using mentor texts and the process/steps you go through to make this a meaningful experience for the students as they look at the text through the eyes of the reader and the writers. This is a great way to break down the process of planning to use a mentor text. When I write with mentors I am always experimenting with my craft. Giving the students a purpose to notice and note as they read and then a craft move to experiment with is powerful! Thanks for your clear advice. Thank you for sharing this and reinforcing the importance of modeling think aloud strategies and intentional planning for mentor texts. I am a Literacy Coach and this hits the mark for our collaboration PD! Mentor texts drive my writers workshop and I am always looking for new ideas and titles. Thanks for sharing Stacey’s new book….can’t wait to read it! Thanks for a great post. Mentor texts are essential to writing instruction! Also, it is important to remember that the students need to be familiar with the text in order to better focus on the craft move you are teaching. I was picturing you arriving in that class, tired and hungry and uncomfortable in your seat, and then listening to Lucy- I think I could listen to her speak or read under even the most trying circumstances. What you say about using mentor texts to support writing and how the book should be one writers have heard before is so critical I think, especially when workshop time is tight. I loved hearing our Second graders refer to their “Jane Yolens” when they talked about craft moves in their own writing this past fall. Made me smile inside and out. And woohoo- really excited for Stacey’s book. Hope I win a copy! It should be out on or about June 3rd. I’m honored you’ll be reading it, Lisa. Thanks for sharing – my summer goal is to ‘organize’ the writing instruction for identified and at-risk settings in order to meet their writing goals. These ideas help me focus on what needs to be a part of that instruction. So nice to be reminded of the importance of mentor texts. I also appreciate you sharing the time that you had to set your plans aside and go with what the students needed at that moment. Mentor texts is something that I really want to learn more about. I heard about just a couple of years ago and would love more information. Will be reading this series looking for any helpful information I can find. I read this blog all the time and often forward it to the teachers in my building. This is definitely one I will pass along! I love using picture books–and chapter books as lessons for writers. I tell them often to read it like a writer. What did the author do to make you love this book so much? What can you add to your writing to make it so enjoyable for your readers? Mentor texts are so powerful. I can’t wait to check out Stacey’S new book! I have been eagerly awaiting it! It should be out in early June, Erin. Thanks for your support! So excited about this book. I can’t wait to share this post with the teachers in my school. I’m flattered you’ll be sharing my book with your fellow educators. Thank you. I’ve been looking forward to this book since it was first mentioned here. I’m a big believer in mentor texts so I know it’s one that I will want to own! What an honor to know you will be reading my book, Michele! i love your lead….being pulled into the moment and feeling like I’m sitting beside you at class one evening at TC. The details of the chairs and the headache and the growling stomach and the the magic of Lucy Calkins reading Shortcut, show the power of using a mentor text! Love the “Now Try It” part of this post. The give away of Stacey’s book is a bonus! This series is a perfect fit for my professional development goals. I’m working to expand my use of mentor texts and look forward to the rest of the series. As always thank you for the insightful comments and recommendations on how to utilize mentor texts during mini-lessons. You’ve peaked my interest regarding the lead used in Dangerous Animals. Hopefully my school library has a copy! Thanks for all the great tips and reminders, Beth. The lives of our students are so rich with mentor texts, we have a huge responsibility to bring them texts that spark and encourage, so they in turn will find their own mentors as they (and we) continue to grow as readers and writers. Excellent points – to grow writers, we must foster a love of reading, and one of the most powerful mentor texts is one created with and for students. Teachers need to write, too. Students need to hear the complexity of thinking behind the craft so that the process is less abstract. -Well said! Thank you for sharing this great post! Mentor texts are so powerful and our students are so proud when they write “just like “their favorite authors. Good reminder to use mentor texts that students are familiar with and how a mini lesson can be derailed if they haven’t spent time with the book.